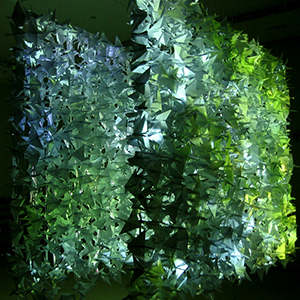 One Thousand Birds is an installation by Kathy Hinde with surround sound by Matthew Fairclough. Each time the installation is shown, the paper birds are re-made by people from the local community, inspired by the story of Sadako Sasaki. he remembered the Japanese legend that anyone folding a thousand paper cranes is granted a wish. She attempted to fold 1000, as a wish to live. However, she only managed 644 before she died – her friends finished the rest for her so she could be buried with 1000 birds. A statue of Sadako holding a golden crane was built at the Hiroshima Peace Park in memory of her. On the statue is a plaque: “This is our cry. This is our prayer. Peace on Earth.” Every year on World Peace Day (August 6th), people from all over the world fold paper cranes and send them to Sadako’s statue in memory of the innocent victims of war. Video images of origami birds being folded, strung together and hung in trees are projected onto one side of a hanging of 1000 paper birds. Images of the same paper birds floating down a river, through reflections of trees are projected onto the other side of the paper mass. 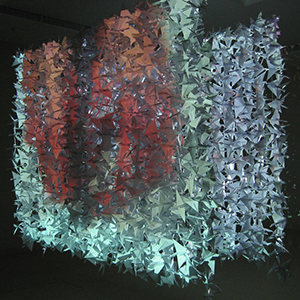 Using the paper birds as a projection surface causes the imagery to distort and fragment, spilling onto the walls. It is only at certain viewpoints that the images can be read.